Vladimir Isaakovich Ehrlich (1924 - 2001) was born in Novopavlovka, Vradievsk district, Odessa region. 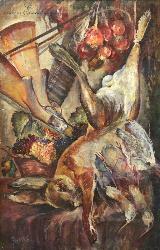 In 1946 – 1950 he had been studying at Dnipropetrovsk Art College at the Faculty of Painting. His teachers were Pogrebnyak and Panin. He ia a participant of Republican and Union exhibitions. He lived and worked in Odessa. He had been a member of the Union of Artists of the USSR since 1963. He died in Israel.